It’s finally here, friends. The book I researched on the shores of the Dead Sea. The book I wrote on a lap desk in the passenger seat of my car in hospital parking lots for four months while my husband lay comatose and paralyzed, in his own Dead Sea. The book of archaeology and excavations and heartbreaking dead ends and nerve-jangling discoveries. The chronicle of dislimbed bones and pottery heat-blasted into trinitite glass. The book of a lost city that wouldn’t stay lost. It’s here, and it’s stirring up trouble. Discovering the City of Sodom: The Fascinating, True Account of the Old Testament's Most Infamous City (Howard/Simon & Schuster) describes how, why and where God detonated a literal firebomb over a targeted spot in a valley in the Middle East early in human history. It is about dirt, but not just any dirt: Dirt honed in on, like GoogleEarth zooming in from outer space. Or, more accurately said, from Infinite Space. My co-author, Dr. Steven Collins, did something that many other professional archaeologists scoffed at. He used the Bible to track down a major archaeological find: what is now the largest official dig in the entire Jordan Valley of Israel and Jordan. Off limits to excavators for decades because of the regional wars and now a joint project with the government of the Hashemite Kingdom of Jordan, the hulking mound of Tall el Hammam is a massive site with hundred-foot-thick battlements, fertile with finds. I was privileged to give its history a voice. I’d like you to share in my excitement. I want you to have a copy of this book. I’ll randomly choose two of you who tell me why you'd want to read this book. Just reread the Biblical account this week. Will be interested to see what discoveries are being made. Wow - this book sounds fascinating, Latayne! I'm completely intrigued! I want to read it because I'm itching to know what secrets and truths you unearthed. And because, well, it's just so topical in our society right now, isn't it? I can imagine you're stirring up trouble with this one! The pressure to be politically correct has never been so intense, and I for one am feeling the squeeze. Give me a dose of good old-fashioned Biblical truth - I think I need the reminder! I've wondered how big the cities of Sodom and Gomorrah actually are. And did the cities turn to pillars of salt like Lot's wife? And was Sodom hit by a comet.I didn't know you were a doctor. This book sounds extremely interesting. I would love to read it! I'm so excited about this book, Latayne! I'm interested in reading the book that God made possible despite obstacles. I also want to read it because I KNOW that the glory goes to God for this book. There is not much more inspiring than that! I am so excited to read this book, Latayne. I love archaeological mysteries and research. Congratulations on the release! This book has me intrigued. Looking forward to reading it. Congratulations! That cover would totally catch my eye in a bookstore. The story of Sodom is such a scary/sad/scandalous/intriguing one. The fate of Lot's wife especially lingers with me. I'm excited about the combination of a writer like you and a topic like this. I have always been fascinated by biblical archaeology, and I know you will handle this subject in your usual powerful, honest style. I ponder a lot about biblical history...each of us has our own interpretation, which is right..I'm excited to read how you have presented the account of Sodom...The Bible is a wonderful account of human history, and so amazingly true of people today..
Congratulations, Latayne! We are so proud of you. It's intriguing that he used the Bible to determine Sodom's location. Can't wait to read it. I'm currently reading Bodie Hodge's Tower of Babel, and I'd love to read your book on Sodom as a follow-up. It sounds fascinating! Karen, Angie, the book IS fascinating. I look forward to reading it again. We've been so excited and anxious for the release of this book. And, wow, what a cover! Congratulations on the release of your book, Latayne. I'd love to read it because your blog post intrigues me, and because Dr Collins used the Bible to track down the site of the dig. Toss my name in! I love archaeological tales. I'm looking forward to finding out what they find and what stories the artifacts tell. I love when the Bible proves archeology and vice-versa. And how nothing archeology has ever found has contradicted anything in the Bible. are a story of God's justice. God tells us to be in the world but not of it. Not becoming a part of it. who was rescued by two angels. I'm excited to read what you've found. This is another testament to the truth of God's word and it's accuracy. I love it when God is proven right, yet again! Congratulations on your exciting book release! Latayne, I'm so sorry for the heart-wrenching experiences you've been through. I hope you have some peace and joy in your life at this point. I would very much love to receive a copy of your book because I live not far from the Dead Sea in a community of Americans, Israelis, Russians, Canadians, Brits, South Africans, Ethiopians, and only God knows who else, on the West Bank of the Jordan River and we're not allowed to safely and freely travel to the ruins you've described. I wish you much success with this book. Will it be available in Israeli bookstores or only on Amazon? Congratulations, Latayne! I'm fascinated with Biblical Archaeology and I can't wait to find out what was discovered about Sodom! I hope and pray this book falls into the hands of those who need to hear the truth about God's sovereignty and power (including me). The book will blow you away! It's an exciting bit of history and it's been a privilege to be a witness to the creation of this book. All of us at Novel Matters are left stunned, encouraged, and in awe of Latayne's immense heart and talent. This is an area I know very little about, would be great to start with this. I've been studying Genesis since September. As we went through the story of Sodom I thought about your book. After following your journey writing this book and all the obstacles you and the publication encountered, I am even more excited to read it (and see you in October). So exciting to see how God is going to use all of this! I am constantly amazed the the level some people can rise to - what may be accomplished under the most pressing of circumstances. My hat is off to you and congratulations, Latayne. I want to read this book because I respect you as an author AND I love/read/write Biblical fiction. I've always been a history buff and am really coming to love Biblical history. And I've read several of your books and know that you are a great writer!! Headed over to Amazon to look for this book, because I know I'll want to read it whether I win one or not. I love how history is actually HIStory...the saga of God revealing Himself in the affairs of man. Even in this tale of judgment, I'm sure the ultimate goal of redemption shows through clearly. Latayne, I salute you for your courage and for a faith that refuses to shrink from handling a subject fraught with political turmoil. I'll read the book whether I win a free copy or not, but it would be a blessing to win! Are you kidding me, you really need to know a reason why? The subject matter is reason enough. A fascinating story, even more so as it is based on truth. Would love to lay my hands on a copy. Thank you. I'd love to win a copy of your book because I love pointing people to "other" sources of literature that prove God's existence. 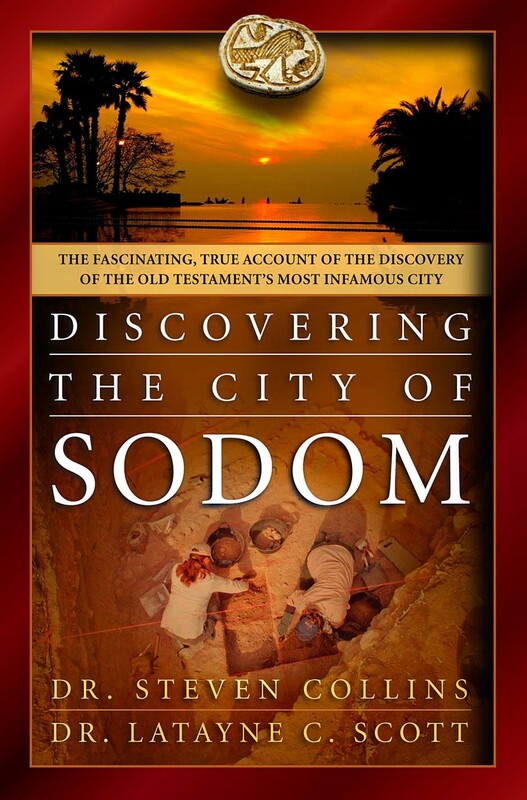 This book should prove to those who are non-believers in the Word of God that history can be replicated as the remains of Sodom are unearthed. Our current society demonstrates how the beginning of Sodom became infamous. I look forward to reading such a historically correct reading with all the embellishments of your writing. Thank you all! I am going to keep the contest open through tomorrow. Bless you for your encouragement and support of this new "baby" of a book. The book sounds utterly fascinating. I would love to read it! Latayne....I want to read Discovering The City of Sodom for loved ones...both dear friends and cherished family members who are gay. I'm not looking for specific answers to the homosexual issue but a deeper understanding of that event. And knowing a bit of your back story and sacrifices to write it will make it that much more of personal read for me. Thank you. Congratulations to Rachael Phillips and Susan who won copies of my book! Please email Latayne at Latayne dawt comm with your mailing address! Winners chosen randomly via random.org.